Temperatures have dropped as low as minus 28 degrees. BITTER COLD WITH temperatures lower than Antarctica gripped the American Midwest today, grounding flights, closing schools and businesses and raising frostbite and hypothermia fears for homeless residents. Mail deliveries were suspended and people encouraged to stay home in nearly a dozen US states where the mercury plunged into the negative double digits, the worst freeze to grip the region in a generation. 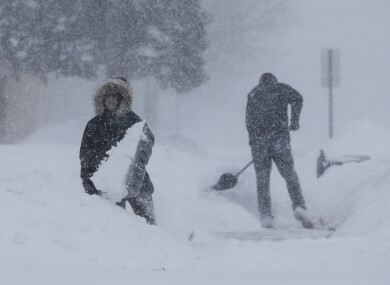 US media have attributed at least five deaths since the weekend to the freezing conditions and a major snowstorm that preceded the blast of Arctic air currently gripping the region. In Chicago, blocks of ice floated on the downtown river of America’s third-largest city and flames from gas burners heated regional commuter rail lines to keep them functioning. The morning temperature in the Windy City was -30 Celsius, which felt like -46 Celsius with wind chill. It was colder than Alaska’s state capital and even colder than parts of Antarctica. “It feels like being close to dry ice, so I can feel my skin tighten up,” Leon Gilbert, 31, told AFP. More than 1,800 flights were canceled at Chicago’s two major airports, while rail operator Amtrak scrapped train services from its hub in the city. The US Postal Service — known for its commitment to bringing the mail whatever the weather — suspended deliveries in parts of Indiana, Michigan, Illinois, Ohio, Iowa, the Dakotas and Nebraska. The cause of the sub-zero chill affecting tens of millions of Americans was a swirl of arctic air that broke away from the polar vortex that usually encircles the North Pole. The agency predicted temperatures to remain 25 to 45 degrees below average through Thursday, with wind chill values as low as -32 to -48 Celsius. “The dangerously cold wind chills could cause frostbite on exposed skin in as little as five minutes,” NWS said. Residents of Grand Forks, North Dakota, faced a bone-chilling -35 degrees Fahrenheit, with wind chill temperatures as low as -63, and it was -27 degrees in Minneapolis, Minnesota. “The bitter cold temperatures pose a real risk to people across the state,” Illinois Governor J.B. Pritzker said on Twitter after touring state emergency operations. “The National Weather Service continues to predict dangerously cold sub-zero temperatures and the priority must continue to be on keeping people safe,” Whitmer said in a statement. Authorities and health experts warned that frostbite and hypothermia could set in in minutes in the extreme cold. Chicago’s regional electric train service was canceled due to wire problems caused by the freezing temperatures, as gas burners heated rail switches to keep trains moving on a reduced schedule. Flight cancellations piled up throughout the United States, with more than 2,500 by mid-afternoon, stranding travelers such as Brandon Robinson who was spending extra days in a downtown Chicago hotel. Remnants of a weekend snowstorm continued to plague portions of the northeast US — with strong winds and blowing snow reducing visibility on the roads. Heavy snow was forecast in the northern stretches of Maine and snow squalls were predicted for other parts of the east coast of the country. Email “Colder than Antarctica: People told to stay home in a dozen states as big freeze grips America”. Feedback on “Colder than Antarctica: People told to stay home in a dozen states as big freeze grips America”.